The year that my parents were married, my mother's mother gave them a pair of homemade Christmas stockings. Red velvet with fake leopard fur cuffs, they had my parents' names appliqued in green felt. My mother's name was stitched on with small pearls, my father's with black beads. A couple of years later, when both Melanie and I had arrived, my grandmother made our stockings, also in red velvet, but with rabbit fur at the cuffs. Our names, from the time when we were called Kim and Mel, were cut from blue felt, and sewn on with sparkly beads and sequins. When the stockings were new, their only decorations were a few small, shiny gold leaves and red beads sewn on near our names. Over the years, however, we developed a tradition of pinning or sewing onto the stockings small items of importance to us: my mother's Phi Beta Kappa key, my father's pins from various architectural conventions, Melanie's and my pins from music competitions and other activities. Long after Melanie and I knew that Santa Claus was not the one who brought our presents, my parents continued to fill our stockings on Christmas Eve. Sometimes the best things come in small packages, and small packages fit in stockings. In 1976, the Christmas after I turned sixteen, Melanie's and my stockings contained small wrapped and beribboned boxes; in each was nestled a single key. A car key. We ran outside in our nightgowns to find a turquoise 1967 Mustang in the driveway. Never had two teenage girls (or at least we two) dressed so quickly, nor cared so little about what they wore. We just wanted to get out in our cool new car. 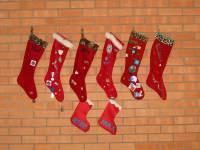 For many years, our family stayed the same size, and the four stockings went up over the fireplace every Christmas. Then, when Melanie and I were in our mid- to late-30's, things changed. Paul and I moved in together, then married. Melanie and Lee moved in together, married, and had Max and Reed. During the premarital cohabitation periods of our relationships, Melanie and I bought green velvet stockings for Paul and Lee. We stitched their names on in red felt, and added a few decorations. We joked that they were the not-family-yet version. After Melanie and Lee's wedding, my mother (never a fan of sewing) had red velvet stockings, with leopard cuffs and their names in black felt, made for Paul and Lee. This year, the question of stockings was raised again. Max, at three, was old enough that Christmas meant something to him, and he could read his own name. It was time for him, and therefore his brother, to have their own stockings. My mother had no more red velvet, but she had lots of red felt, and some blue. She also had some crochetwork that she had removed from an old pillowcase. However, my mother doesn't have a sewing machine. So, she and my aunt stitched the small stockings by hand, then stitched onto them letters that my father cut from the blue felt, and crocheted lace cuffs. (Note the very architectural block letters, as compared to the script of the other names.) That my mother would sew something by hand is a testament to how totally in love with her grandsons she is. I expect that, sometime in the next few years, Max and Reed will receive their own full-sized, handmade red velvet stockings. 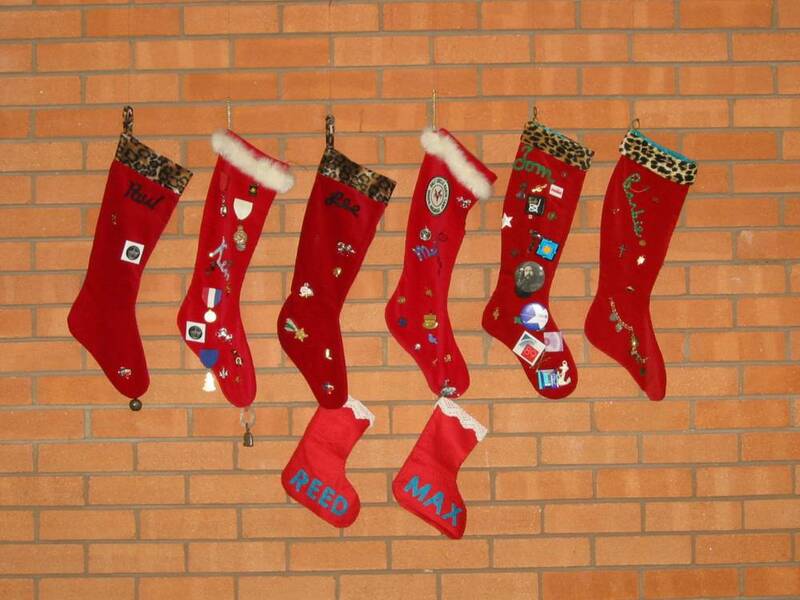 This year, the baby-sized stockings hanging beneath their parents' stockings were the perfect touch.